Play Poker for Fun and win cash prizes! Play For Fun Poker is free, fun online poker in a friendly community of online poker players. Play Texas Holdem poker for fun with others who are playing just for the fun of it. Win Real Cash in our daily Multi-Table Poker Tournament. Compete in free ring games, free and fun poker tournaments and even free multi-table tournaments! 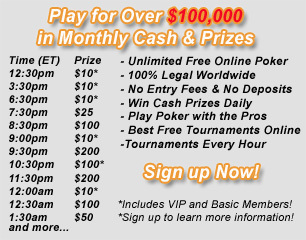 Watch for upcoming special events including fun online poker tournaments with real prizes.